Heat My Space & Alfresco365 > News > Heat My Space: Feeling Chilly at Your Desk? Install Heat My Space Under Desk Heater Only £84! Heat My Space: Feeling Chilly at Your Desk? Install Heat My Space Under Desk Heater Only £84! Infrared Heater Panels (IHP) have 30 years of engineering design experience who offers range of heating products with extremely efficient operation, all of which are made in Britain. Designed to be angled for mounting in room corners and under desks 59.5 X 29.5 cm | 160W. Available in both black and white colours. Custom colours, sizes and shapes are also available, however these may involve a slight increase in price and lead time. They are high performance far infrared heaters which look superb when mounted on either ceilings or walls. Their unique, angled swept-back sides give the illusion of a floating frame of zero thickness. The product is engineered to a design that allows the panels to be virtually flush with the wall or ceiling, further enhancing its modern, stylish, unobtrusive look. We are able to advise on the best combinations to fit your project. 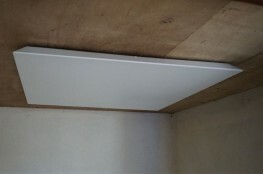 The IHP has been designed for use attached to a ceiling or wall using brackets.